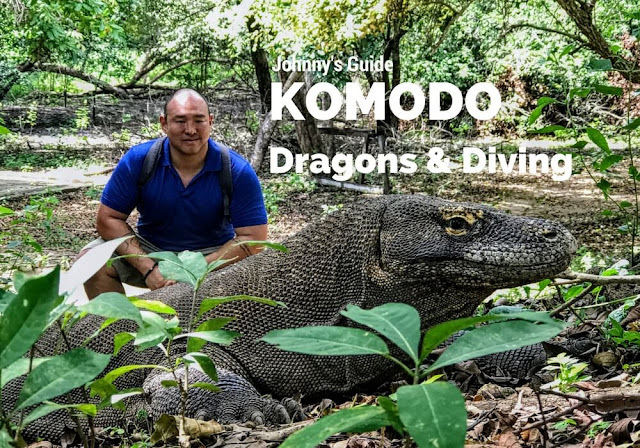 I first heard about the legendary Komodo islands almost six years ago when I was working as a divemaster in Thailand. Komodo is not just the home to the largest reptile on Earth but also some of the world's best scuba diving. I put it on my bucket list and wanted to go, but was always lacking either time or money to make the trip. I either had free time but no cash, or extra money but I was working too much to take the long journey. It wasn't until I sold my last dropshipping store that I was able to free up both the time and money to go explore these remote islands. From everything I had read, there was limited infrastructure on these islands. No Wifi, no 3G internet, and even the water had to be brought in from the mainland. However, that's all changed. The water is still brought in daily, I'm living in a wooden bale hut with no doors, but the internet situation has changed. Not only do I have fast 3G to tether off of at the dive resort but I'm currently connected and writing this while sitting on a boat, an hour into the national park, surrounded by sea. My buddy who I'm traveling with just finished refreshing his inventory for his store, cleared his email and is now taking a nap on the sun deck. Everyone else on the boat is taking a week holiday from their finance jobs back in London, Hong Kong or America. For most of them, this is a one time trip of a lifetime. For us this has become our lives. In this post i'm going to share all that Komodo has to offer both above land and under the sea. Keep reading for everything we did, where we started, the best places to spot Komodo Dragons, the trekking, the scuba diving, and all of the info you'll need to do the same. Welcome to Komodo. Welcome to the land of the Dragons. I flew from Bali (DPS) to Komodo (LBJ) on Garuda Indonesia Air which is the best airline that flies that route and had a really good experience. My buddy flew Wings Air which is the budget airline and said it was fine as well, however, we both had a terrible time trying to book the flights online as this is Indonesia, and combined they rejected five of our credit cards for no reason. My friend had to call in, send them a scan of his passport, and credit card just to buy the flight, which then resulted in someone at Tiket.com committing fraud on his card. If you've read my first post, the guide to Canggu, Bali, you'll know that credit card and ATM card scams are common in Indonesia due to their government letting criminals get away with it. It's a huge shame as it discourages tourism and forces us to spend less time and money in their country due to it being hard to withdraw and spend money safely in this country. The good news however is that unlike the international arrival area at Bali's airport, the domestic terminal is actually really nice, both coming and going. 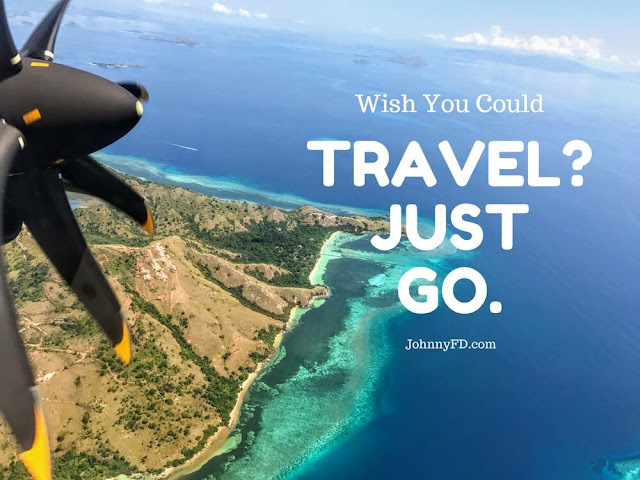 When landing in Komodo (LBJ Airport) you'll actually be in the town of Labuan Bajo in Flores which is the closest place of entry. From there you'll need to take a local taxi into town and a boat to wherever you actually need to be. There are shared mini-bus taxi's at the airport that charge 20,000 IDR ($1.50US) and they're quite easy. Don't pay more than 50,000 IDR ($3.75US) for a private taxi as it's only a 20 minute drive. Here's a video of how I got from the airport, onto a boat, and to the resort I ended up diving with. There are only two hotels in the actual Komodo National Park, the first being Komodo Resort (expensive) and the other being Kanawa Resort (terrible reviews). You can also stay on a Liveaboard but expect to pay around $300 a night for a decent ship. That being said, most people don't stay in the actual national park itself. Close to 99% of people stay in Labuan Bajo, the port town where the airport is. They have a ton of hotels and cheap hostels and is close enough to do day trips to Komodo. There are 20+ dive centers based in Labuan Bajo so finding one is pretty easy. But because I've stayed and previously worked for Scuba Junkie in Borneo (my guide to Borneo) and combined with the glowing reviews on Tripadvisor I knew they were probably the best. The unique thing about Scuba Junkie Komodo (SJK) is that they're actually an hour south of Labuan Bajo in the middle of nowhere, which is both peaceful and allows you to be closer to most dive sites without having to pay Komodo Resort prices. I ended up getting a 5Day/4Night package for in a private bale for $526US that was all inclusive including diving, accommodation and meals. They have private rooms as well but from what I heard from other guests, they were poorly designed with not enough windows for air circulation, and that the Bales were actually better. They had no real door and a shared bathroom, but honestly, it was awesome. It was never too hot, there were no mosquitos, and they had a safe behind the reception where you could keep your wallet for the entire week as you didn't need cash for anything. The only minor annoyance was that I was put in a room with twin beds even though my reservation was for one with a single queen but I was so exhausted everyday from diving that I slept like a baby and was too tired to ask to be moved or repack and move my bags. During my last two days in Labuan Bajo, I stayed at a hostel called Bajo Nature Backpackers as I wanted to be right in town and wanted to meet some other travelers. It was good for both, had great lockers with easy to use programmable codes, free breakfast, and decent sleep for being a shared dorm. Scuba Junkie Komodo itself was a fantastic place with good food, and great diving. It wasn't as social as Borneo or places in Thailand as all of the divemasters were local so there wasn't the normal banter you get with your Western divemasters. But it didn't really matter as the dive days were extremely long with most being from 6:30am till sometimes 5pm. It's not somewhere I would do my divemaster training if you also wanted to have a social life, but people go to Komodo for the diving. Don't expect to stay up late having beers as most people are in bed by 9pm as we're waking up by 6am on most days. The breakfast on the boat was pretty good with eggs, bread and pancakes daily. They had Bali coffee which isn't' as good as normal drip but a million times better than Nescafe so I was happy with that. Lunch on the boat was generally pretty good as well, with the exception of the day where they served fried rice and an egg with no veggies or meat as a second dish. Dinner was the highlight meal of the day and was always amazing with tons of food, variety, and great flavors as they weren't afraid to use a bit of spice. The only thing that sucked was the fact that between 12:15pm-7:15pm you would starve as the only thing available was cookies or a doughnut of some sort. I wish that dinner either would have been served earlier, there was some sort of food on the boat on the ride back, or even if they just allowed you to have the soup you would have had at dinner at 5pm instead of the sugary snack. My advice is to bring nuts, or some other type of food to eat in the afternoons after your last dive and before the late dinner as there's no where to buy food once you're here. The gear itself, staff, boats, and facilities were all top notch. I used to work at their Borneo location a a few years back when I was a divemaster so I knew they were the best dive operators around. I'm glad to report that they've kept up the same standards in Komodo. Here's a video from my first day diving in Komodo with Scuba Junkie. Before coming, there was a serious lack of information about things like internet access, what the rooms were like, what to bring, and what to expect, which is why I'm including it in this guide. According to other reviews I've read online, mainly on Tripadvisor, there was no Wifi and barely any 2G. Everyone had basically said it was an island with no connectivity which was one of the reasons why it was hard for us to plan our trip as both of us work online. The good news is that even though there still isn't Wifi, the 3G at the resort is actually pretty stable and decently fast. You can't upload videos or large photo albums but emails, skype, a few photos here and there are all fine to do. Out of the 5 days I was there, the internet was only unusable for one of the mornings. In the info emails they also tell you to buy a SIM card from the port town of Labuan Bajo as the ones from Bali don't work. It turns out that some of the ones from Bali don't work, but both of our Telkomsel cards were fine. The easy way to check is if you get internet at the Komodo Airport or in Labuan Bajo, you'll also get it at the resort and on the boat. If you don't, pick up a new sim card in town and make sure its setup correctly to work before you leave the shop. ATMs just like in Bali are subject to cloning/skimming so double check before you use them, don't have more than a few thousand dollars in your checking ATM's account and cover your PIN. We had one guy on our boat that got over $1,000 taken from his account while we were scuba diving from using his card in Labuan Bajo. The water temperature was also quite a bit colder than I was used to in Thailand or even in the rest of Bali with water temperature varying from 23-27c. We wore full length 3mm wetsuits with boots and although it'd get chilly sometimes, it was fine. But if you're prone to be cold, you'll want to bring hood or a vest along with you. I also read you should buy a reef hook in Bali before you come as the currents are strong and you'll need them to take photos and watch Mantas. They were right, they aren't for sale anywhere in Komodo or Labuan Bajo but they did have fishing supply shops so we made our own! But it turns out that all of your divemasters will have a heavy duty one that you can simply hold onto and share, and we only used it on 2 out of the 10 dives so there's really no reason to buy or make your own unless you're an advanced photographer and want to have your own. Here's how we made one for $2 out of fishing supplies. Get your diving courses finished before you come to Komodo. Even though you can technically do your open water there, it's more expensive, more difficult and not worth it. Most sites weren't actually that deep so you could just come with your open water and not your advanced, but since there's often heavy current both at the surface and before the sea, you'll want to have some experience and be comfortable in the water. Thinking back, even though most of those sites had cool stuff to see, Komodo has to be on the #1 dive spot in the world for me so far. The only place that might be better that I haven't been to yet is the Galapagos or Raja Ampat. Sipadan in Borneo was great for their sheer abundance of white tips sharks and turtles as well as easy diving with nice coral, but Komodo had Mantas and was more adventurous. The only place I've seen this many Manta Rays was during the night dive in Kona Hawaii, but it felt a bit like an attraction at disneyland with the tourism built around the artificial lights and literally zero swimming around. Here is one of the best dives I did with Manta Rays in Komodo, it may have been the craziest dive of my life with the amount of heavy current and fish life swimming around. One nice thing about diving with Scuba Junkie was that on the last day you stop by Rinca Island for an hour for a short hike and to see Komodo dragons. I ended up doing a full day of trekking afterwards but the best photos with dragons were actually from this stop over, so most people opted for another day of diving and going straight to the airport after seeing the dragons than what I did. If you've ever fantasized about what it would be like walking the Earth with Dinosaurs, this is about as close as you can get. These giant lizards which have been around for 4 million years can grow up to 2.6 meters long which is 8.5' feet. They can also weigh up to 91kg which is 200lbs! There's a big argument on whether it's better to spot Komodo Dragons on the island of Rinca which is smaller and less built up, or on the main larger island of Komodo. The truth is that unless you plan on spending multiple days there staying at the ranger station to do research, or unless you take a private boat there for sunrise, the chances of you seeing dragons in their natural active state is very low. Most of the dragons you'll see at either site are going to be hanging out near the ranger station or the artificial watering hole as they get fed kitchen scraps even though they aren't supposed to. Even though we go for short hikes on both islands, the chances of spotting them in the wild are actually extremely low as they are well camouflaged in the tall grass. Since these are wild creatures with no fences keeping them in, you're not actually guaranteed to see any, even at the ranger station. So consider yourself lucky with whatever you see. If you want to increase your odds of getting good photos, plan on doing a second day trip. Aside from seeing the Komodo Dragons, there are also some of the most breathtaking viewpoints in the world in the Komodo National Park. Unfortunately, it's not part of Scuba Junkie's package so plan on staying an extra few days in the port town of Labuan Bajo to get the whole experience. I originally wanted to book a 2 day/1 night tour where you sleep on the boat, but since my flight the next day was in the afternoon and you don't get back until 5pm, I had to just do a day trip. To be honest, it was long enough and I don't know if I would have wanted to be on a small wooden boat for that much longer. The highlights of the day or overnight trips are seeing the dragons on Komodo island itself, snorkeling with Manta Rays at Manta Point, and hiking up to the view points on the small island of Padar. I booked the trip the day before at a small office near the hostel in Labuan called Christians, but honestly I think they're all the same as people on my boat came from all different tour operators. Prices for the 1 day tour ranged from 400,000 - 650,000 IDR based on which shop I went to but I ultimately ended up paying 450,000 IDR which is $34 for the 1 day tour. The tour itself was an amazing deal and included lunch, water, and snorkel gear. Seeing Mantas and Komodo Dragons on the same day, along with the viewpoint of Padar was easily worth double or triple that price. If the local tour companies were smarter, they would either break those up into different days, or charge more but have English speaking tour guides and more food. 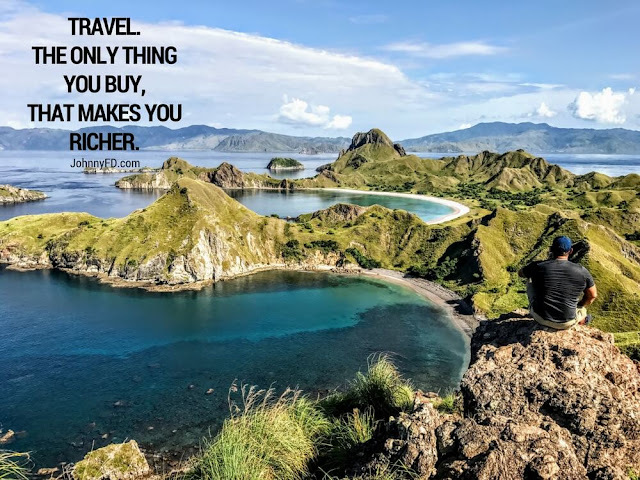 One of the things I knew I wanted to leave this trip with was a photo from the top of Padar Island overlooking the bays and crystal waters below. I actually wanted into the shop and asked specifically if I could take a photo like this during my trip and only went with the tour that said yes. The island is almost 4 hours away from the mainland and gets scorching hot when the sun comes up as it's completely uncovered. This means that tours leave at 5:30am just to arrive before 10. There was zero information given by the tour operator, which is a major reason why I'm writing this guide. First off, plan your trip for just after the rainy season if you want the hills to be green and not desert brown. I did it in April which is one of the greenest times of the year. Also don't bother booking any of the non-scuba diving tours online as it'll be more expensive than the local tours which always have room. Once you actually get there and book your tour, buy yourself something for breakfast the night before as there is nothing served on the boat until 1pm. Bring an extra large bottle of water, sunscreen, a hat, and decent walking shoes. The hills are very steep and the loose rocks make it almost impossible to walk up and down in flip flops. And if you can, get yourself a pair of noise canceling headphones for the loud boat ride over. I wore my Luna running sandals and were fine, but would suggest most people wear at least tennis shoes. Even though the trek up to the top is only about 45 minutes, the sun is blazing and people were hurting from dehydration and possible sunstroke halfway up, which is why most people didn't make it to the top. Bring water, wear sunblock, and definitely wear a hat. If you have bad knees, you'll need a walking stick to get back down. As for the viewpoints, even though the first few are pretty good, you'll want to keep going up as they get better. The other short hikes I went on include the walk around the hills of Rinca island, which was only around 25 minutes long, and the one at Komodo National Park, which also around 25 minutes was their short hike. They have longer ones but the rangers don't like doing them as it's hot and there's usually nothing to see but if you really want to do it, there are medium and long treks you can go on. It's wayyy better than snorkeling in Bali. In fact, I'm pretty sure whenever someone mentions how amazing snorkeling was in Bali, they really mean when they left Bali and went to one of the other islands whether it be the Gili islands or Komodo. Here on this Komodo adventure we swam with sharks and manta rays and it was amazing! I honestly feel bad for anyone who goes all the way to Bali and doesn't go to Komodo as this was the highlight! This may have been the best vacation of my life. It combined everything I love doing, scuba diving, seeing wild animals, hiking, and exploring. This really as a trip of a lifetime and I highly encourge everyone to put it on their bucket list. The only other place in the world that came close was the nature and diving that Borneo had to offer. The last two must dive spots for me that are still on my list are Raja Ampat and the Galapagos. Aside from that my bucket list is getting a bit slim, so if you have any suggestions on the world's best dive sites, let me know in the comments below. I still have a ton of video footage so expect another video or two to be added to this post when it's ready. It's such a blessing being able to make enough passive income to make trips like this possible. But even without having my businesses be automated now, it's good to know that digital nomads can still come to Komodo and have fast enough internet to tether off of. I hope to see all of you on top of Padar and under the water at Manta Point! I love scuba diving not only for the adventure, but also for the wonderful and unique things you get to see below the water surface. In the past years I've taken a lot of interesting and amazing pictures which I like to store in the https://dive.site logbook, along with all my diving logs.